This article is about the ending video entitled "Yozora". You may be looking for the character. The Master of Masters forms a heart shape with his fingers covering the full moon. "Yozora" is the secret ending of Kingdom Hearts III. Like previous secret endings, it ends with the phrase "Reconnect. Kingdom Hearts". Sora and Riku, separated and disoriented, awaken in an unknown world filled with modern buildings, skyscrapers, cars, and signs. The two walk the streets observing where they are, Sora finds himself at a crosswalk staring at a building with the number "104" displayed, while Riku stares at a large building. As Riku walks past the large building, Yozora, the protagonist of Verum Rex, sits alone atop watching him down below. 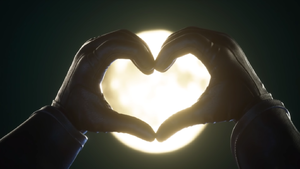 Elsewhere, on the roof of another skyscraper some distance away, The Master of Masters frames the full moon with his hands, then forms a heart shape over it using his fingers, symbolizing Kingdom Hearts. Beginner Mode - Beat the game and photograph all 90 Lucky Emblems. Standard Mode - Beat the game and photograph 60 Lucky Emblems. Proud Mode - Beat the game and photograph 30 Lucky Emblems. This page was last edited on 17 March 2019, at 12:34.